With a Star Wars movie every year, that means a new annual tradition: a truckload of new toys releasing in the months ahead. The Force Awakens had “Force Friday,” and Rogue One will be no exception—and io9 has got an exclusive look at some of the new toys that will be on shelves at the end of September. Alongside a bevy of other toys from manufacturers like Funko and Lego, Hasbro will be releasing a new wave action figures featuring characters from the first Star Wars spinoff. 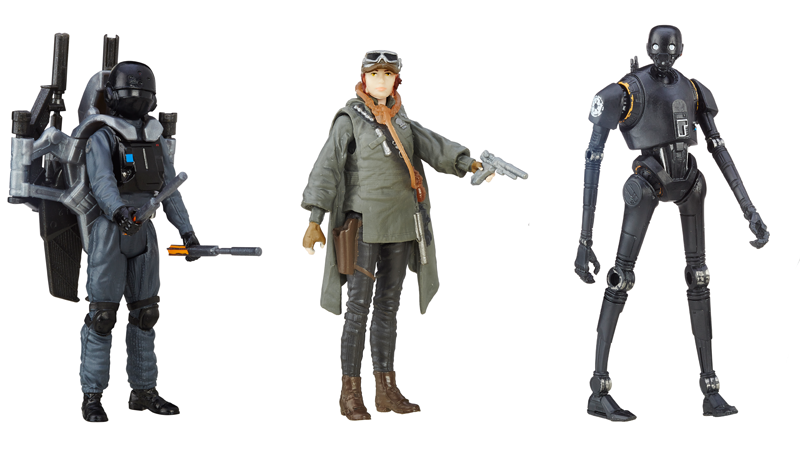 In the first wave of 3.75" action figures there’ll be versions of Jyn Erso and K-2SO for the Rebels, and the Imperial Ground Crew member and a Stormtrooper for the Empire. Not all the new figures in the first wave will be from Rogue One, however—also available are figures of Kanan Jarrus (in a Stormtrooper disguise) and Sabine Wren (with her season 2 hair colors) from Star Wars Rebels, and Kylo Ren and Rey from The Force Awakens. As well as the single figures, there’ll also be a new series of deluxe two-packs in the 3.75" scale featuring new characters as well as massive accessories for them to get decked out with. From Rogue One there’s sets with Moroff and the Scarif Shoretrooper, and Rebel Commando Pao and an Imperial Deathtrooper. Meanwhile from The Force Awakens, there’s a set containing a First Order Snowtrooper and Poe Dameron in his Resistance uniform. Finally, Micro Machines are back again after their big return for The Force Awakens—and as well as individual sets of vehicles and microfigures, there’s going to be a huge new Death Star playset to go with them. This 360-degree model of the Death Star opens up to reveal three different areas based on locations from Rogue One: Jedha, Scarif, and of course, the Death Star itself. As well as a projectile launcher to recreate the Death Star’s planet-destroying laser firing, the playset includes microfigures of Jyn Erso and a Deathtrooper, as well as Micro Machines models of an AT-ST, Imperial Cargo Shuttle, and Directer Krennic’s black shuttle. All these toys—and plenty more—will be available from September 30th, while select items from across the range of Rogue One products will be available to pre-order online at HasbroToyShop.com and other retailers from September 2nd.